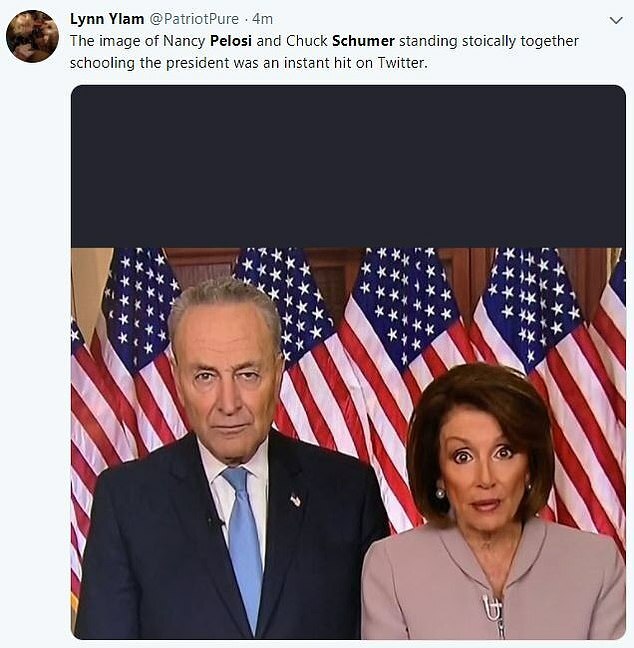 Twitter was flooded with memes Tuesday night comparing House Speaker Nancy Pelosi and Senate Minority Leader Charles Schumer to ‘disappointed parents’ as they responded to President Trump’s Oval Office address. 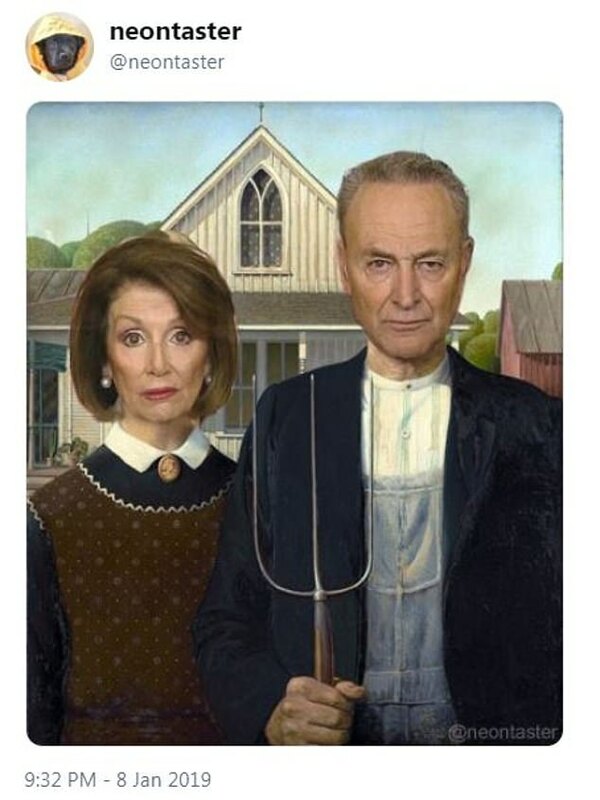 Pelosi and Schumer used their allotted time after Trump’s prime-time speech to rip his ‘obsession’ with the border wall and castigate him for ‘throwing a tantrum’. 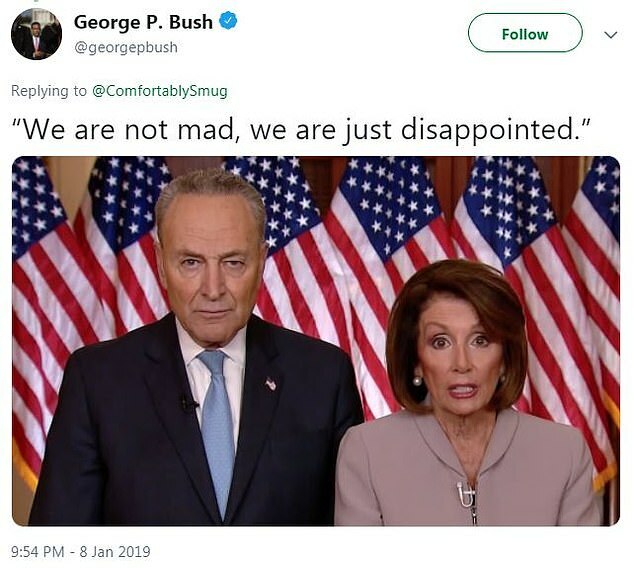 Schumer and Pelosi, who both served in office during the shutdowns of the Clinton administration where House Republicans ended up getting most of the blame, blamed the president for a ‘senseless shutdown’ and called the wall ‘cruel’ and unnecessary. Meanwhile, Twitter users wasted no time pointing out their stone-cold sober appearance. 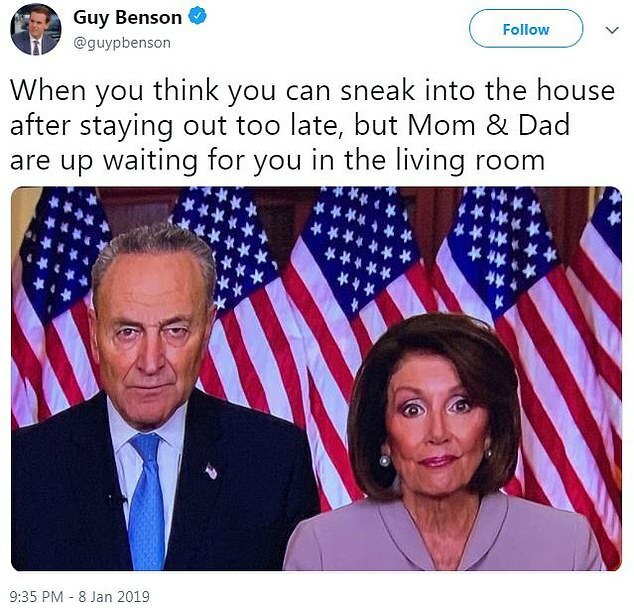 Another user quipped: ‘When you think you can sneak into the house after staying out too late, but mom and dad are waiting up for you in the living room,’ one Twitter user quipped. 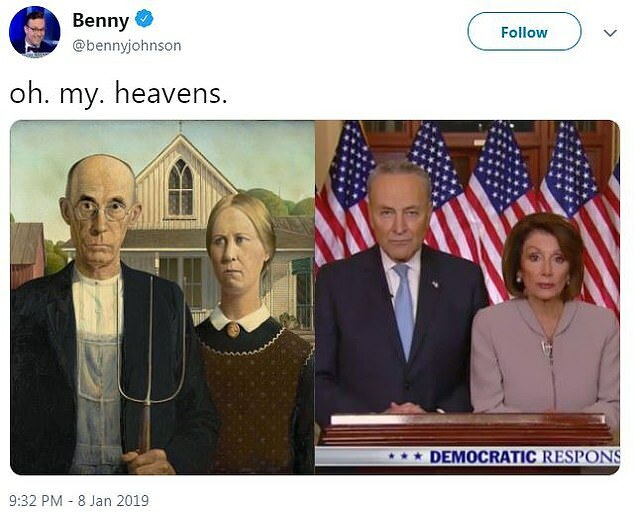 Others compared the pair to Grant Wood’s classic 1930 painting American Gothic. 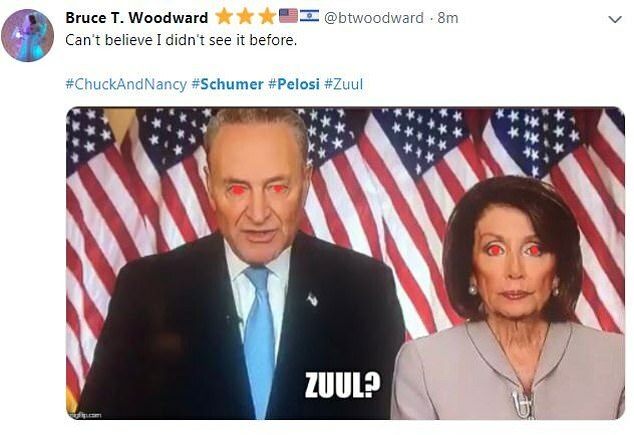 Pelosi said: ‘The President has chosen fear. 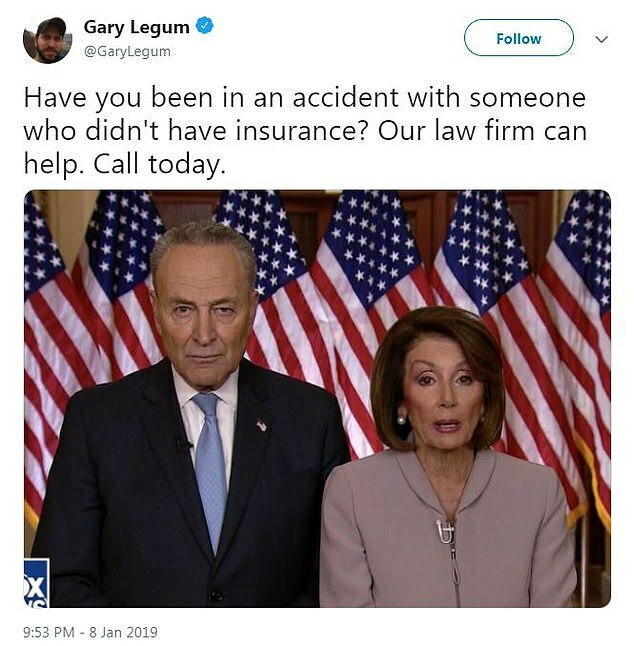 We want to start with the facts. 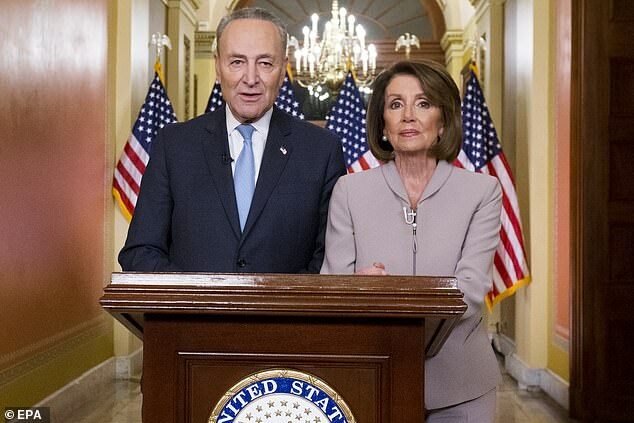 ‘The president is rejecting … bipartisan bills which would re-open government – over his obsession with forcing American taxpayers to waste billions of dollars on an expensive and ineffective wall – a wall he always promised Mexico would pay for,’ Pelosi said, keeping a stern expression on her face and speaking directly to a single camera in the Capitol with Schumer alongside her. 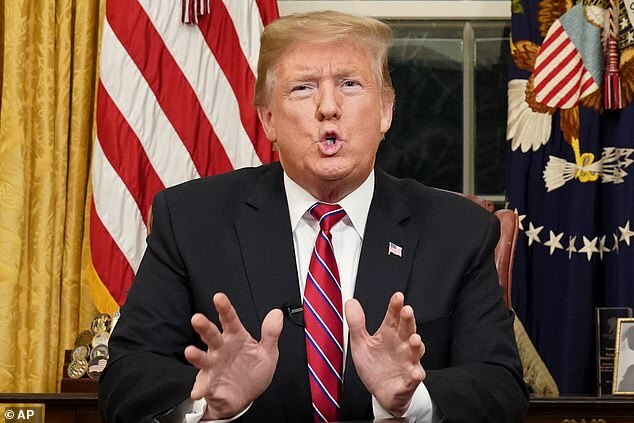 Pelosi responded to Trump’s emotional appeal: the president mentioned rapes and human trafficking at the border, as well as individuals murdered by illegal immigrants. ‘The fact is: the women and children at the border are not a security threat, they are a humanitarian challenge – a challenge that President Trump’s own cruel and counterproductive policies have only deepened,’ Pelosi said. Schumer was equally slashing in his own remarks. 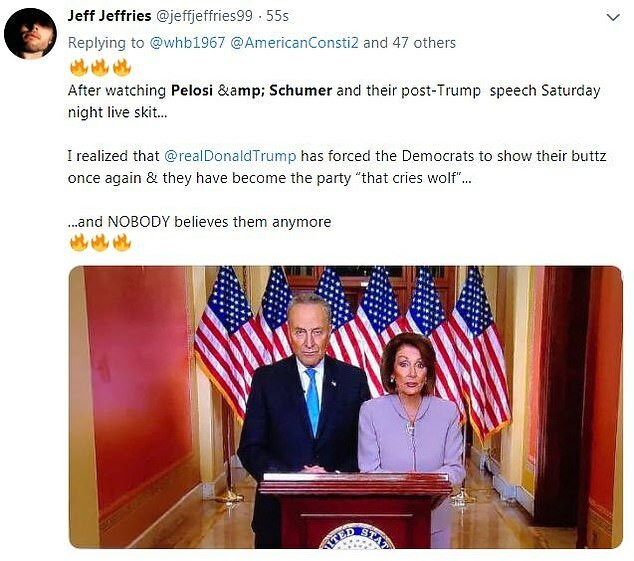 ‘My fellow Americans, we address you tonight for one reason only: the President of the United States – having failed to get Mexico to pay for his ineffective, unnecessary border wall, and unable to convince the Congress or the American people to foot the bill – has shut down the government,’ the New York Democrat intoned. ‘American democracy doesn’t work that way. We don’t govern by temper tantrum. No president should pound the table and demand he gets his way or else the government shuts down, hurting millions of Americans who are treated as leverage,’ Schumer said. ‘Make no mistake: Democrats and the President both want stronger border security. However, we sharply disagree with the President about the most effective way to do it,’ Schumer continued. ‘There is an obvious solution: separate the shutdown from the arguments over border security,’ Schumer offered. ‘He urged moving forward with the current House Democratic plan of passing spending bills that originated in the GOP-run Senate. But Senate leader Mitch McConnell has already rejected it, saying he didn’t want to waste time on votes he cast as being only for show. The Democratic leaders elected to try to pummel Trump on the wall, his payment pledge, and the shutdown itself, mindful that the president has never topped majority public approval, and the border wall also lacks majority support. But the president has an advantageous pulpit in shutdown situations, and often is able to set the terms of debate.